I have 4 new sets of guest size graphic art soap. These guest soaps are perfect for a guest bathroom, kitchen and make wonderful housewarming or shower gifts. Several also work well for Valentine's Day. Each set is scented to coordinate with the artistic images embedded in the soap and layered with soap of coordinating colors. 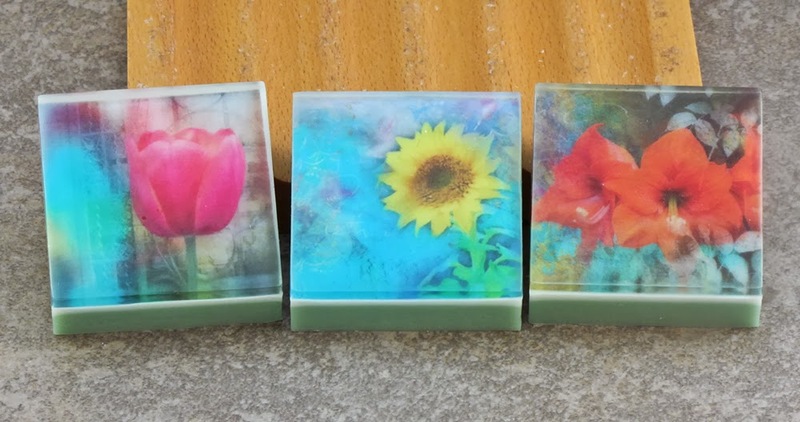 These soaps measure about 2" x 2" and weight approximately 1.8 ounces each and sell for $8.00 per set of 3. For information on how I create these types of soaps, you can view my tutorial here: How to use Water Soluble Paper. Copyright 2006 - 2013 Alaiyna B. Designs. All rights reserved. All text and images are the property of Alaiyna B. Designs. No part of this document or webpage may be reproduced by any means without prior written consent of Alaiyna B. Designs.